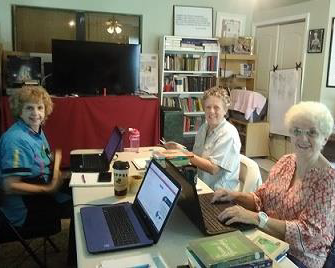 The TS Study Centre in Bradenton, FL, has enjoyed holding their meetings at the Mitreya Center, an interfaith meeting place. 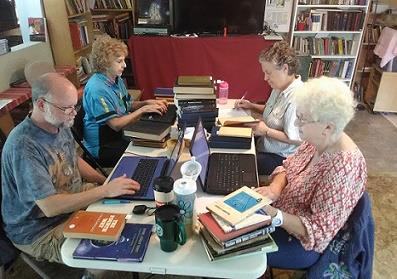 A few members of the TS, however, saw an unmet need at the Mitreya Center – its library needed some TLC. 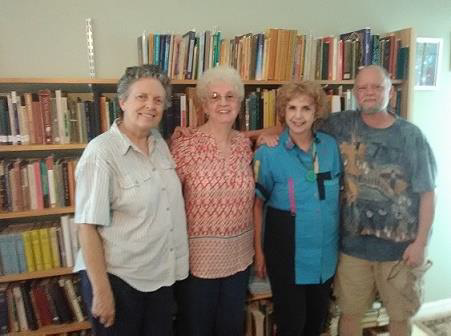 Five members of the Bradenton TS/TOS group decided to take on the massive project of reorganising the Center's library, so it would be more accessible to the centre's many visitors. The group is creating a library catalogue, which will be available to the greater Bradenton community, as well. TOS Liaison, Alec Grae, who has been volunteering in libraries since the 4th grade, explains, "TS materials are interspersed with other topics of interest, because of the other groups that also meet here. But the vast majority of items are of interest to the TS as well." The main contributors to the project are: Donna Lobdell, Ann Willig, Judith Snow, Alec Grae and Jeannette Rothberg. Jeannette is not in the photos. In addition to cataloguing the entire library contents, Alec says, "we will be converting a large collection of Krishnamurti's VHS lectures to DVD," so the lectures will be more accessible. Alec found appropriate equipment and software for this aspect of the job for about $40, paid from the Bradenton TS group's funds. What's behind the group's desire to spend such an incredible amount of time and effort on this library? Alec explained, "We feel the library will be more user-friendly for our group, as well as others, who meet at the centre. Maybe we will be able to connect with other, likeminded seekers, who will also enjoy the library, and bring more interest to the group and TSA as a whole." Hands in the air for the Bradenton TS/TOS!